A fun recipe to use up some of that proliferation many of us experience in the summer months: zucchini!! 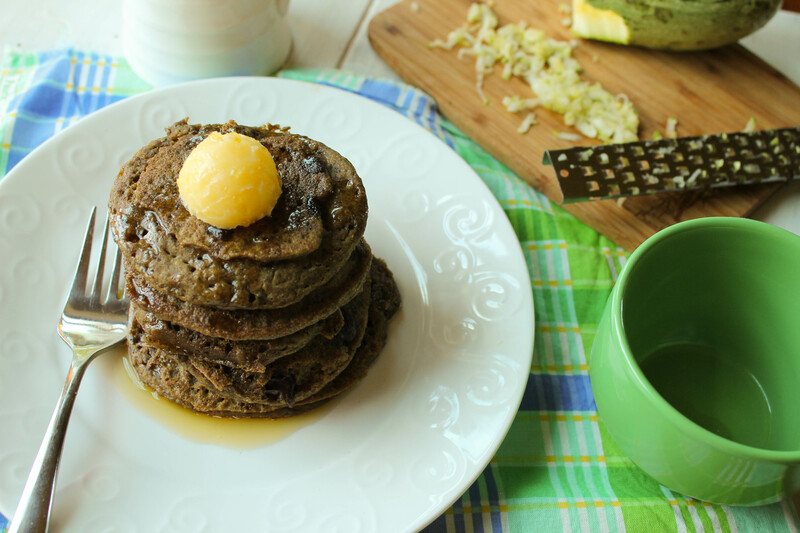 I figured gluten free zucchini pancakes were a great way to get some additional produce into my kids…and I bet you will too! Nothing better than a recipe you can compile all within the convenience of your blender or food processor! At least in MY world!! These pancakes were born of a desire to use up more my garden’s zucchini. And since my kids are OBSESSED with pancakes and waffles for breakfast, getting a serving of vegetable into these breakfast staples is a nice bonus. You won’t notice the zucchini, it blends right in and lends a lovely moist crumb to the pancakes. If the batter seems thin, it’s OK to add a couple tablespoons of any of the flours to thicken the batter to a typical pancake batter! I do NOT recommend the ginormous zucchinis that have loads of large seeds and watery pulp in the center…so be sure to scrape that part out if that is what you are using! Keep a rough balance of 1/3 starch and 2/3 wholegrain, and the pancakes should perform well. I know some people do not keep teff around (but you should! ), so sub if you need to and share your tweaks with us! I think brown rice, sorghum, or gluten free oat flour would all make good subs. Have you checked out my GF flour tips page? Although I have some updating to do, there is lots of helpful information there for newcomers. Place all the ingredients in your blender or food processor, in order listed and blend until smooth. Cook pancakes in a preheated, well greased pan. OR, these work great as waffles too! What a lovely recipe ! So simple, healthy, and gorgeous delicious too ! I don’t have teff but I do have cassava flour. Do you think that the recipe needs 3 kinds of flour or can I just make with cassava? Excited — they look so good! Cassava flour is one of the few flours that should work well all by it’s self Carol!! Let me know! Ha ha, i was just thinking of how much summer zucchini we have. It’s always handy to have a delicious recipe to use them up. These look SO good! I want them right now! 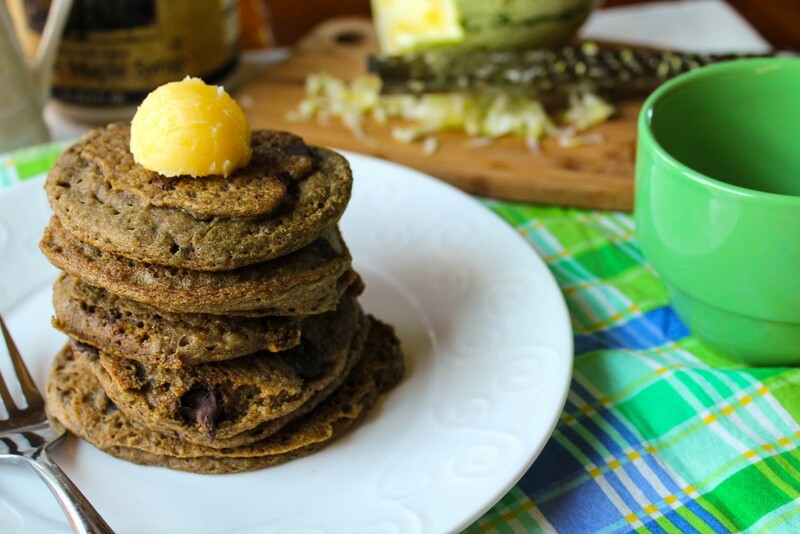 😉 I love the combo of zucchini and chocolate, but pancakes is such a yummy place to put them! Such a great way to sneak in veggies into a sweet breakfast! This looks perfect for a weekend brunch. Oh yum! I haven’t used teff flour in so long and this has inspired me to get some. I love how it tastes in pancakes! Such a fun way to use that summer zucchini too. I love this recipe! Great way to hide those veggies for kids and picky eaters! These look so absolutely delicious! I love putting zucchini into my breakfast in some form, usually a smoothie but this is way more fun 🙂 The chocolate chips make them even better! These look incredible! Is there any way to make these without all of the different types of flour though? Hi Jess! What flours do you have? 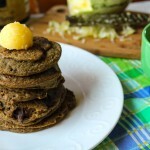 Delicious pancake with chocolate chip and zucchini. thanks for sharing with Hearth and Soul bloghop. pinning. When this recipe calls for teff, millet, and tapioca are you referring to flour or the cooked grains? wow, how bovious Stephanie, I can’t believe I totally missed that when I wrote it, so sorry! Flours! Off to fix it! 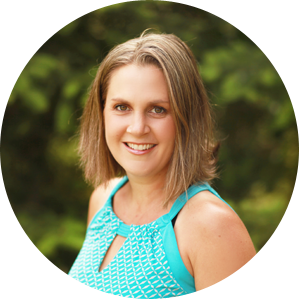 Hi Tessa, I absolutely love your blog because it is such an encouragement to me. We have MANY different needs in our family and as it looks like I need to avoid most if not all grains now I am kind of struggling to feed my family with HEALTHY food but no: gluten, eggs, nuts (the dangerous one here), legumes, and now grains?!? I’ve noticed some of your awesome recipes do have nuts or nut flours in them. Can you recommend some recipes (perhaps already posted but I missed) for meals, not so much dessert, that meet the above avoidance criteria? The combo of no nuts/eggs/grains is really hard for me. Any suggestion you have at all would be GREATLY appreciated. Thanks so much for your time. Hi Rebekah! I know that feeling of being overwhelmed to well. Good for you for being proactive about your health! Grain free/egg free/nut free baked goods do exist, but they are a dime a dozen…eggs are almost always necessary. The majority of my grain free/Paleo meals however fit your criteria. Click on the tag “grain/free Paleo and scroll through. If there is a couple of ingredients you need to swap out and need help, let me know. Also, look into Auto Immune Paleo protocol recipes online, those should fit your criteria too. Practical Paleo has a whole chapter on auto-immune protocol and a 30 day meal plan to go with it, worth checking out. The Phoenix Helix blog is another area, she has done this way of eating too. Hang in there, you are not alone! ps Rebekah, another good key word search would be paleo + vegan recipes. Some will have nuts obviously, but it will narrow the pool. Chowstalker/desertstalker will also let you search recipes based on dietary needs, and autoimmune is among those! These look AMAZING Tessa! 🙂 You are featured this week on Simple Meals Friday! Thanks for sharing. Hey – these look great, but I don’t see choc chips in the ingredients. How many do you use? 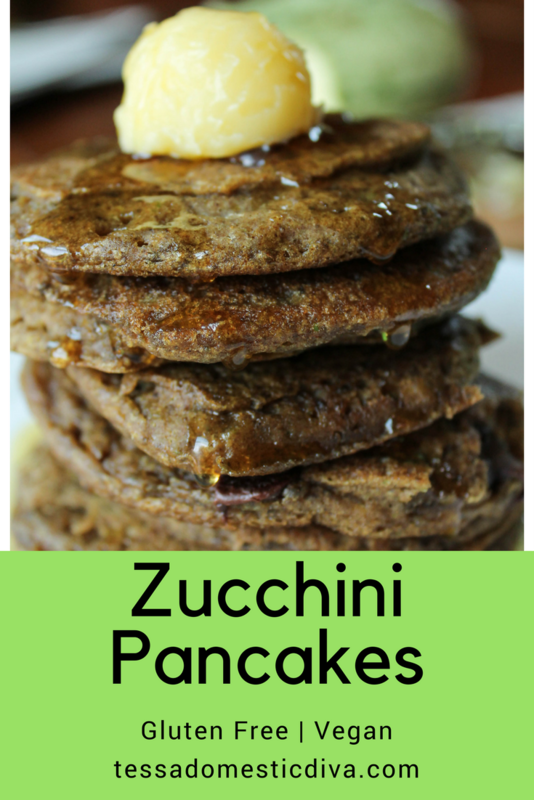 I love blender pancakes, and what genius to add zucchini to them! Thanks for linking to Healthy 2Day Wednesdays! Chocolate and zucchini= perfect combo! Thanks for sharing on Wildcrafting Wednesday. Those look wonderful. Any recipe that sneaks in veggies is a winner with me. Thank you for the suggested ratios for flour to starch. That will make it easier for me to make the substitutions since I don’t have teff (my bad). Looking forward to trying this out this weekend. Oh Tessa, these look fabulous!!! Love, love. Always looking for healthy breakfast recipes. These look great! Thank you for linking up with us for Tips and Tricks Tuesday! I love the fact that you keep a variety of “types” of recipes on this site. We don’t subscribe to one type of diet, whether that be pale, GAPS, SCD….we have many food allergies and try to work with those as well as eat as balanced and healthfully as possible. Lots of eggs and nuts won’t work here, neither will too many sulphur foods. But rotating nutrient dense foods that will work for our allergies is important, and using grains like teff and millet fit right into that idea. Thank you, I have a GIANT zucchini that was hidden all these weeks that needs attention! Thanks Jean…we are operating on the same premise in this family!! Everyone has different needs and different bodies, so it is important to do what works on an individual basis!